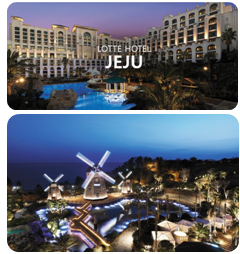 Lotte Hotel Jeju is a luxury resort of Lotte Hotels & Resorts, opened in 2000 in the heart of Jungmun Tourism Complex. The hotel features a total of 500 guest rooms, 9 restaurants, 6 banquet halls, fitness center, foreigner-only casino, duty-free shop, and diverse convenience facilities. Hotel buildings are spread across mostly on a slope of land, granting a majority of the rooms a spectacular view of the charming gardens and the open sea.